Wow, these were absolutely fantastic. I read many reviews before I made these so I made some changes to the recipe based on all the reviews......I doubled the recipe and made the following changes. 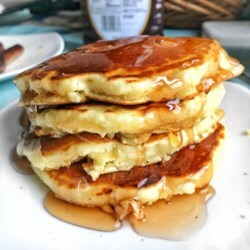 I used 4-teaspoons baking powder, 1-teaspoon cinnamon, 1/2-teaspoon nutmeg, 1-tablespoon vanilla, 1/2-teaspoon salt, 3-cups milk, 3 eggs lightly beaten and 1-stick butter......I melted the butter then added the milk to the butter and heated it (just heat, do not boil). So I had 3 bowls - 1 with the dry ingredients all sifted together, 1 with the warm liquids and 1 with the eggs lightly beaten. I then added the liquids to the dry ingredients and mixed a bit then added the eggs to the mixture. Mixed with a wire wisk until it was well blended together. I let it sit on the counter for 10-minutes before cooking. Served with bacon and eggs. This was made for 4-people and none was left. The kids told me these are best pancakes they have ever had and to never use bisquick again. Thank you so much for the fine recipe. Its a keeper.